California’s Central Coast is a vast, rugged landscape stretching from Santa Barbara north to Monterey Bay. It’s wild country with a gorgeous coastline and few towns. Wide open with fertile farming soil and abundant ranchland, this place attracted more than just farmers and cowboys it also attracted artists, rebels, seekers and bon vivants from the Bay Area and the Los Angeles sprawl. The confluence of their unique personalities put a stamp on the burgeoning wine region and today, rule-breaking and non-conformity are celebrated values. Four Vines honors the anti-establishment views of the Central Coast’s eccentric personalities. We make interesting wine, for interesting people. Back in the day, carnivals would travel between the Los Angeles metropolis and the San Francisco Bay Area. The journey was a long one and crews would need to stop in one of the Central Coast’s small towns for an overnight break, often putting on a show to pay the way. The locals enjoyed hosting clowns, acrobats and contortionists among this always colorful crew. Post WWII, women had gotten a taste of a new lifestyle. Factory work. Pants. Respect. Freedom. In California, this was expressed through riding motorcycles in clubs like the famous Motor Maids, and claim their share of the open road. Central California, with its long twisting highways, sparse population and mild climate, was a favored running ground for these female bikers. Antiestablishment youths of the 1950s were known as “beats”. Allen Ginsberg, William Burroughs’s and Jack Kerouac are the best-known Beat writers. After the core group met in New York, the central figures ended up together in San Francisco where they became friends of figures associated with the San Francisco Renaissance. In the 1960s, the expanding Beat movement was incorporated into the early 1960s hippie culture which would make its way down the Central Coast to Los Angeles. The 1960s ushered in a new era of self-expression and artistry. What once seemed taboo in the cultural mainstream was becoming accepted, giving rise to new styles and movements, and influencing artists like Bridget Riley and Judy Chicago. These free spirits travelled the California Coast, meeting fellow artists along the way and broadening their appreciation for the human form. Entertainment that’s freakish yet graceful, strange and unnatural… presenting The Kinker Cabernet Sauvignon. Born in the red rolling hills of Paso Robles’ east side, The Kinker is full-bodied with bold flavors of black currant and chewy tannins. Forging one’s own path, going it alone… presenting The Maverick Pinot Noir. Grown in the shadow of a long dormant volcano in Edna Valley, The Maverick is zesty on the palate with cherry cola and dried cranberry flavors with hints of earth. Bohemian in spirit, artistic in nature … presenting The Form Chardonnay. Sourced from extreme coastal vineyards in Edna Valley, just a stone’s throw from the Pacific, The Form is voluptuous and sensual with alluring notes of mango, lemon zest and baked apple pie. A historical trail that links California’s missions, the El Camino Real or “Kings Highway” in Spanish, begins in San Diego and runs 600 miles north to Sonoma. 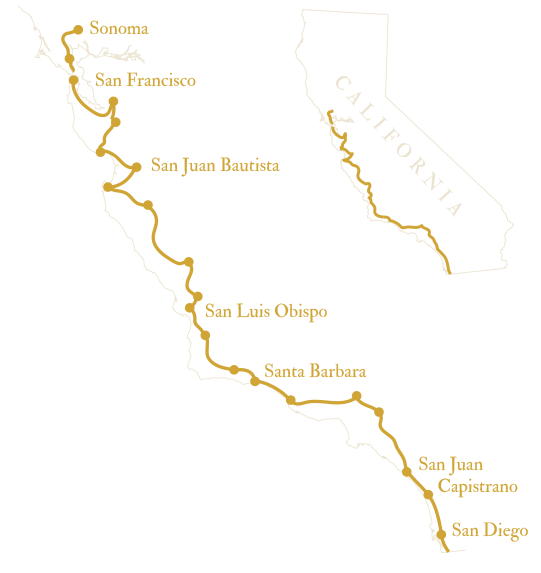 Another name for this route could be the Wine Highway as it was the trail the Franciscan friars traveled bringing the first vinifera grape cuttings from Europe to California. The Central Coast was home to several missions, including San Luis Obispo and Santa Barbara, where the friars planted vineyards for the production of wine and brandy. Today the El Camino Real is lined by commemorative markers featuring tall shepherds crooks topped by large bells. 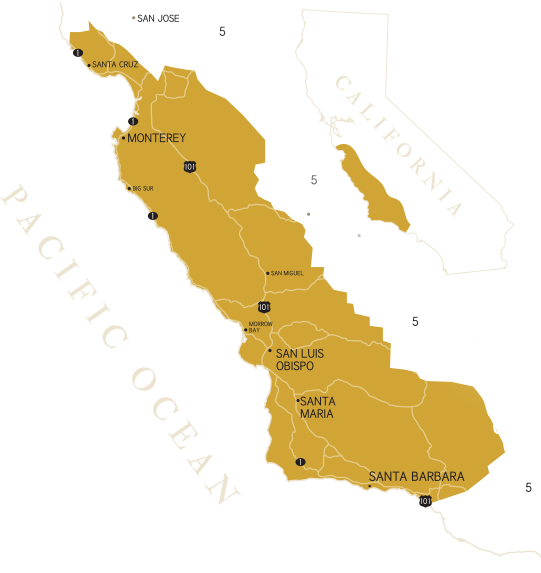 Stretching from Monterey Bay all the way to Santa Barbara, the Central Coast AVA (American Viticultural Area) is home to 40 smaller growing regions such as Paso Robles and Edna Valley. Most Central Coast vineyards run east to west, open to the chilly Pacific Ocean. As the interior begins to warm, cool, moist air is pulled into the valleys creating morning fog and reducing sun exposure. Grapes are fond of chilly evenings and ripen slowly and evenly under these conditions. More hang time on the vines equates to more flavor in the glass!  Diversity is what sets Paso Robles apart from California’s many growing regions. Featuring numerous microclimates and soil types, the Paso Robles American Viticultural Appellation (AVA) has a Mediterranean climate marked by warm days and cool nights. On the west side of Paso, the soil is nearly white and quite porous – ideal conditions for Zinfandel. Conversely on the east side the soil is red and clay-based, the perfect environment for Cabernet Sauvignon.  Known for its extreme coastal vineyards, the Edna Valley runs east to west, surrounded by volcanic mountains. With moderate sunshine, cool maritime fog and volcanic terroir, the Edna Valley appellation hosts California’s longest growing season. The valley is cooled by breezes from the neighboring Pacific Ocean and is best known for Chardonnay, Pinot noir, and to a lesser extent, Syrah. Four Vines is distributed throughout the USA. Whether it's being served by the glass at your favorite restaurant, or sold by the bottle at your wine shop of choice.